The huge Tullos Plantation was near here prior to the Civil War. As the railroad developed, a lumber operation began in the early 1880s. By the middle of that decade the town had an estimated population of 100 and in 1887 a post office was granted. The name of Bissell (a local surname) was first used, by settlers from Missouri and Illinois renamed it in the 1890s. The town made an attempted growing peaches and formed the 1,000 acre Glendale Orchard Company. The community prospered and reached a population high-water mark of 1,200 by the end of the 19th Century. Glendale could boast of a newspaper and a two-story hotel as well as churches and most essential businesses. At the dawning of the 20th Century, the timber was playing out and residents looked for greener pastures. By 1914 the population had dropped to a mere 75 residents. It fared a little better in the 1930s but not by much. The population was reported to be 120 from the 1930s through the 1960s. The 2000 Census reported 175. Settled before the Civil War, the �Texas State Historical Association� website provides a brief introduction into the origin and evolution of the community of Glendale, TX, located on Hwy 94, about eleven miles west of Groveton. A prominent land owner was the antebellum Tullos Plantation. Apparently, the establishment of the Cameron Lumber Company attracted workers for employment in its sawmill. By 1886, a population of 100 had developed and a post office, called Bissell (named for a local family), was opened a year later. Settlers, primarily from Illinois and Missouri, renamed the town Glendale for the rolling hills in the area. Another industry introduced by the new residents was that of growing peaches and other fruit. They formed the Glendale Orchard Company on 1,000 acres of purchased land. At its peak population of about 1,200 around the turn of the 20th Century, Glendale had a two-story hotel, school, several churches, and a newspaper. However, as the lumber industry began to decline, many residents moved out of the area. 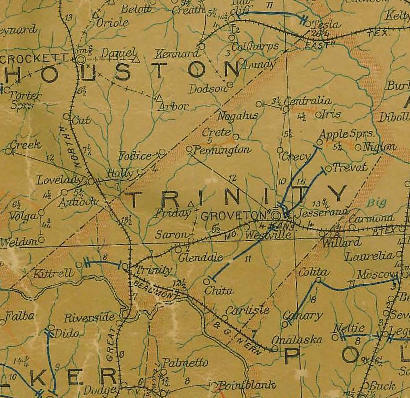 The newspaper relocated to Trinity in 1905. Today, there are less than 200 residents. Grandparents Nellie (Campbell) and William Herman Nicholds acquired land on the outskirts of Glendale, towards Trinity, to �set up housekeeping� and live off of the land by farming for their personal provisions. It is said that Herman worked as a �hired hand� for wages. Herman also trapped mink and sold the pelts. Nearby, Trinity River, its tributaries and back-waters, provided fishing. And, hunting for wild game provided other meat sources. Herman�s parents were originally from Arkansas and had first settled in rural Cherokee County; he was born in Troup in 1892. Nellie was born 1894 in Holly, TX. They are buried at the Glendale Cemetery, along with other members of the Nicholds and Campbell families. The Nicholds� sons (Woodrow Wilson and Hulen Cleo) and daughters (Minnie Iscetta, Marcella Elva, and Joyce Marie) attended the Glendale school. Grandchildren loved to roam through the woods and go to the fishing tank. It was sad when, in later years, the house was moved to property on the outskirts of Trinity, off Hwy 19. Nellie had a great big gardenia bush in her back yard. When going to nurseries today, and seeing those plants in bloom, it brings memories of the �old home place�. [Marilyn Nicholds Bessire / Driftwood, TX] Granny Nicholds kept her left-over fishing minnows in a glass fish bowl in the refrigerator �for another day�. She always had prunes and tried to get us to eat them. There was also a grove of plum trees, and I like plums, so that was something to enjoy. She had several bonnets that she wore out in the sun and made one for me. I liked to sit on the porch in the swing. Granny had an old style washing machine and a scrub board on the back porch and some kind of homemade cabinet or storage bin for the flour. In her house was a vanity that I loved to sit at and which her rouge and makeup were kept; and, an old pin cushion hanging on it; and, a blue vase. She wanted us girls to start a new fashion trend and wear maxi-dresses instead of the mini-skirts that were in style. She chewed tobacco and had a brass spittoon, which was strange to me. An old antique clock was in the living room. I�m not sure Nellie ever used a toothbrush. She would use a peach twig to clean her teeth and massage her gums. And, you know, she never had a single cavity in her 87 years of life! Her cakes and banana puddings were always tasty. A trip to the country to visit the grandparents was something that I looked forward to. Dad loved nature, he found beauty in the simple things, and we would take the back roads from Channelview through Highlands, Crosby, Cleveland, Coldspring, Dodge, and Riverside to reach Glendale. Along the way, dad would talk about the tall pines and the many sights that caught his eye. With four young children crowded in the back seat, it sometimes got a little rowdy; but, if we were good, we sometimes stopped for a treat at the 5 & 10 in Trinity. After we got there, we would get to see the animals and go for a walk to the pond. If the weather was good, we sometimes got to fish for perch and small bass. One year, I remember going with Granny to the church to see the Christmas play. The church was very small, with open rafters, and hard benches. Granny would hang her clothes on the fence around the house to dry. The bed linen and clothes smelled sunny and fresh. We would catch horned toads to put in the garden to eat the bugs and insects. I can remember a couple of aunts coming over to shell peas, using their large skirts as "pans". Churning butter was a mystery to me. It was unique to drink the well water from a dipper. In the mornings, granny would be using the wood burning stove to cook bacon, eggs, and homemade biscuits while, at the same time, warming the house. Walking barefoot in the warm sand to get mail from the box across the street felt good. A cousin, Bobby Ray Nicholds, son of Hulen Cleo, has served as Justice of the Peace, Precinct 3, Trinity County, TX. He has two years remaining in his term, prior to a planned retirement.